Community associations and HOAs are vulnerable targets of financial crimes for numerous reasons. These types of threats will persist whether you’re dealing with volunteers, professional staff, or your board of directors. The answer is not to distrust — it’s building controls that manage the risks of financial misdeeds. 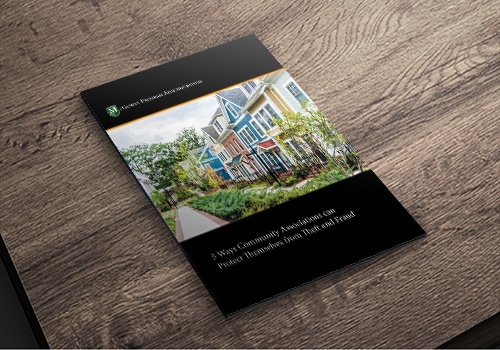 Download your free eBook to learn 5 ways to guard your community association. Incorporating financial controls into your processes will make it more difficult and less tempting for a would-be thief to commit a crime. Learn some simple steps that can make all the difference in safeguarding the association's financial resources. Background checks are only one step to protecting your financial assets. Tightened hiring practices can mitigate some risk, but you also must follow federal, state, and local laws to ensure you're not discriminating. There are some crimes you simply can't see coming, no matter how thorough your protocols are. For those times, fidelity and crime coverage can add a measure of protection where it's needed most.